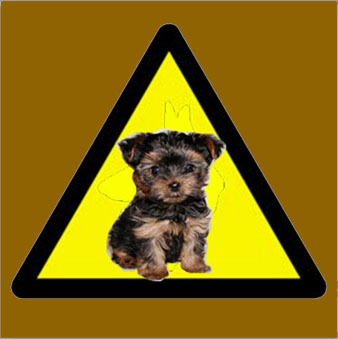 This entry was posted in Uncurmudgeonized and tagged animals, beware of dog!, complaints, humor, humour, nuts, pets, puppy training, St. Bernard, Yorkshire Terrier. Bookmark the permalink. I appreciate the re-blog. The puppy is in charge. My husband and I, I mean *I*, LOL also decided to get a puppy (or two, or three). It’s comforting to learn that even old curmudgeons are so accommodating to their wives’ desires. I’ve been worried since my husband is already starting to exhibit curmudgeon-like traits. We may be curmudgeons but we know who is in charge. Congrats with the new ruler of the house … and hopefully the squirrels, rats, and others haven’t eaten your nuts. Why, thank you. The new princess of our residence is keeping all nuts safe. I understand and appreciate the reblog. Your hands and feet always did remind me of a rat. Your adorableness dog proofed me right. Shouldn’t my dog have ‘woofed’ you right? I, indentured servant, stand corrected. Dogs rule with an iron will, a loving heart, and a velvet paw – so we won’t know that they’re really training us! Congratulations on the pup! Look forward to reading more about your adventures with her. I will have to ask her permission first. Be careful. Little dogs like that have one powerful weapon that a big dog doesn’t. They have a bark that is so shrill, it feels like a nail piercing your skull. Yes, I have experienced the shrill bark, usually in defense of imaginary objects. My congratulations, or condolences, on your Yorkie. Ours, Winston, age 6, is of neutral gender (though you’d never notice it) and is now 6 pounds of squirrel-hunter and street-guardian. It’s his street; he watches from the window and objects if anyone else uses it. I am sure it’s on her list. …and needs soooo much attention. This post was really hard to read, as I was laughing too hard to see through my tears. Whether they were tears of laughter or pain am not quite sure. I forced my husband to get a puppy nearly a year ago. All of our previous dogs have been primarily my responsibility. Now, my husband works at home and I work in an office. It is good to leave my husband with our 65 lb psycho puppy! At least our psycho-puppy is only 3 1/2 pounds. 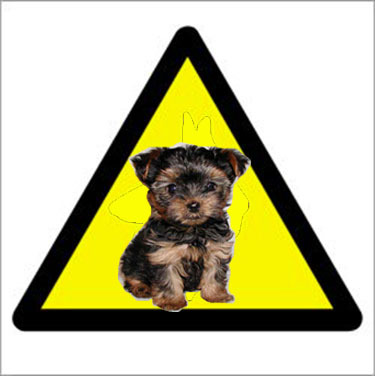 My brother has a Yorkshire terrier. He named him Bill. I met Bill for the first time last fall and fell in love. What a sweet dog! But you’re right–the feet are not safe. It wasn’t so much he went after my feet, but rather, he’d bring his bone over and chew it on my foot. Weird. They are cute but attention seeking, just like curmudgeons.